Beautiful rain last night - 24 mm = almost an inch - with some lovely heavy falls and a few more showers predicted. At last the front paddock is green again! 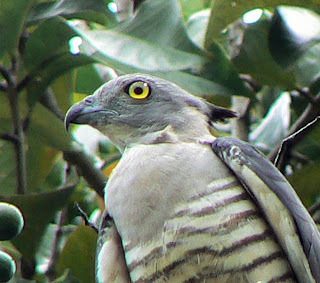 Two huge raptors in a tree outside the office the other day - this is one of the Pacific Baza's and it's mate was on a nearby branch. Beautiful birds but of course they are predators and prey on small animals and frogs - but then that is nature!